The awesomely named Tricero... I think I might push to change the name to Trike. I had to do the Bad guy, Genghis Rex. I wanted him to look a bit more 'primitive', thus the different stance. your work in in very fine detaile and scope of charactor . but for a childs show to adult understanding. 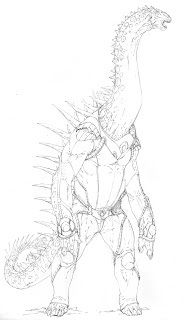 you need to make them more workable for one thing loose the spikes. . on tricero please make his head frile conform to his movements of body in action. and his horns way to big for his small anthomorph face. and please put tools and weapons on these guy. but i know coca cola sony is realy thinking of making a real movie out of this show. 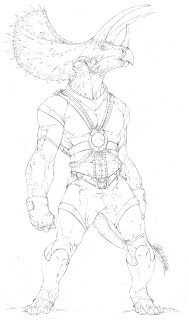 and i would love to see the new dinosaucers look like your art. good luck best too you. Please sign all future posts so I know who I'm responding to. These are the basis for what will be done for the cartoon, I've actually done this before but comics and toys are also being planned for so they need to be a bit more fleshed out for those, this way saves a few steps. Weapons and other such things will be added later once the story is fleshed out. These are just to get the license. The 'spikes' are part of the dinosaur, at least for the sauropod. As for the others, those are there to reflect new theories and ideas. 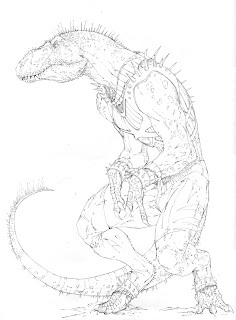 I'm tired of seeing cartoon and comic dinosaurs look like some sort of 70's movie reject. The horns you see on a triceratops skull are covered in keratin, so they are longer than you think. The head hasn't been changed, it's the actual skull, I don't make them look more human, that's what the body is there for. It's a system I've used for years that seems to work. awesome, awesome, awesome. I love your dino anthro characters Brett. Always have. For me personally, I think your style, and level of detail adds a whimsical, but also sophisticated sense to them. I don't know about the guy who posted before me, but these designs are immediately appeasing, probably because my own design sense is similar. Anyways, keep it up. Looks great. I think it's more a 'don't change my childhood memories' thing than anything else. I get it, but since I'm not a fan I don't really feel the need to stay super faithful. That's all for now. Now we wait and see if Sony is receptive... if not we go in a different direction. The drawings are great! But I think Agustinia shouldn't be a bad guy, I think it should be a hero. I just received 2 Spanish Annuals on Dinosaucers. I want to get my head around the motivation of the Tyrannos. Its almost Republicans vs Democrats Im in another country so dont know to much about US. But the Tyrannos do some good and dont seem that bad at times. 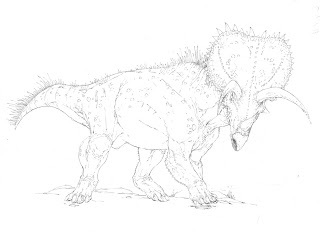 Stego was an adept fighter and I never saw him use his tail- which according to Bob Bakker a very powerful weapon. Im a fan of your work. are they like Races living on Reptalon. OR do the egss just mix up and dinos are basically brought up in communes? that ould explain lady Dei and Rex and Allo and Bonehead. Dinosaucers getting an updade? C'mon they look good and still look good the way they were. Still have a major crush on Teryx after all these years, she's one hot dino babe! I was upset to hear that the original Dinosaucer toyline got the redlight, since at the time I went searching like mad trying to find figurines or modles of the characters of the show. I do miss the show, but I'm a little outraged that someone had made an unauthroized version to DVD, since Cookie Jar entertainment (aka DIC animation) has the rights to it. I thought it was very high tech and entertaining, and brings back memories of when it was a teenager in the 1980's. We'll have to agree to disagree. I thought the show was HORRIBLE. Bad everything, even the base idea. I actually managed to convince the people involved in this to abandon it it was so bad. I doubt you'll feel the same if you watch it now... All those old shows were just horrible. DIC was sold long ago, Sony actually has the majority of the rights. If they aren't going to let people see it on DVD I don't really have a problem with them getting it elsewhere, since it was FREE when it was on TV. Ive written 2 comments and you dont respond to me at all...I didnt write the first comment. anyways I like your ideas. I too am going to draw some dinos and ships as well. I STILL don't understand the relationships of these characters, Meat eaters related to plant eaters... it's all too, reduced to make any real sense and trying to fix it isn't worth it when you can just do something new. Is Terrible Dactly gonna be their and wil he be on the heroes side? wil Quackpot be their aswell and hope he'll be a Dinosaucer..... By the way is this going to become a TV Show for the 21st Century that would be Awesome and what wil it be called?